The Six of Pentacles is the sixth card in the suit of Pentacles. A more positive card than the most recent cards in the Pentacles suit; things are starting to look much more positive and also mature now. Expect to see things how they really are, and to understand how much of a positive change you can make in the world. The Six of Pentacles represents generosity, fairness and long-standing goals. Past – The Six of Pentacles in the Past position can represent past generosity, from you or somebody else. Someone may have given you a great opportunity, although it’s more about things playing through the motions than you going out of your way to get it. You were following a path and reached the goal, which is where you currently stand. To give an example; it could mean that you’ve gone through a period of education and ended up somewhere you wanted initially, but now you’re unsure. Present – The Six of Pentacles in the present position can in a way speak of current uncertainties. You may be blessed with someone and you’re unsure how to use it. Traditional techniques come to mind but it’s likely you need to get off autopilot and start a new approach. You might be engaging with others who have a completely different world-view to you; so in order to integrate, you’re going to need to adapt to their lifestyle, not the other way around. Work / Education – The Six of Pentacles in regards to work or education means a turn for the better. Your boss is likely warming to you if they haven’t already, and you might be in for something good. Think about the previous meanings of the card in this article, generosity and abundance only really fit into a single paradigm, it’s up to you to really improve yourself out of it. Just because one aspect of your life is going well, doesn’t mean your life is going the way you want. Romance – The Six of Pentacles in romance is a mixed blessing. From the outside, your relationship appears like it’s going well, but under the layers we keep hidden there are some issues. The thing is, only one of you might be aware of them. Take care and discuss them like adults. Bring up things. They shouldn’t be your partner if you can’t discuss things important to you. Also, make sure it isn’t a one-sided relationship, emotionally or materially. Friends – The Six of Pentacles in regards to friendship is another mixed sign. Do you only have one good friend, is he or she more of a mentor to you? Likewise, is there someone hanging on to you, and it’s you who puts all the energy in? Friends should be people you enjoy spending time talking to, learning and playing with. You don’t need people who are not good for you, and you are not good for people you cannot help. Money – The Six of Pentacles in regards to finances is quite a good sign regarding money. You might come into more than you know what to do with. 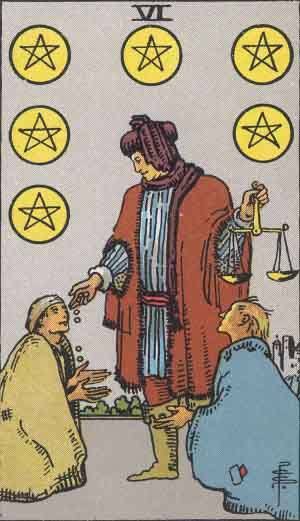 The illustration of the card shows the man giving money away, not entirely because he wants to, but because he feels that he should. You can choose to do this, really. Giving to those less fortune should become something that you don’t feel like you need to do. Smaller acts of spontaneous kindness and generosity are worth a magnitude of measurement more than a standard act of simple aid. Health – The Six of Pentacles is a positive sign, especially if you are currently ill. Established procedures will help you get back on your feet again. There isn’t a lot to be said. If you’re worried about something, speak to someone who has experienced it before. Spirituality and Mentality – The Six of Pentacles in spirituality highlights the sharing aspect of this card. You might be able to help someone along who is following a similar path. Interpret this how you will,but if you have the chance to become a mentor in any aspect of your life, you should take it. Helping others helps you understand concepts yourself, and helps you grow into a better person. In reverse, The Six of Pentacles reminds us to be vigilant about our own generous behaviour. Be mindful of how much you are giving and helping others, as sometimes people may be taking advantage of you. Also, it’s sometimes the ones who help who hurt the most, some types of pain are there to be experienced, not covered over and forgotten about. If you are willing to help with something, examine beforehand if you’re helping for the right reasons. Six represents balance, sympathy and trust. Six is well known in occult tradition and spirituality; the Hexagram being a well known display of six. The Six of Pentacles in regards to numerology shows that you should help others over yourself right now. Someone needs your help but they may not be asking for it. Now is a good time to think long term about your life and where it is heading, who can help you get there, and who you will benefit along the way. If you have many sixes in a reading, it may mean that you’ve just gotten over a major event of your life and are nearing the recovery phase. We’ve selected live tarot readers to give you a FREE 3 Minute interpretation of The Six of Pentacles! Scroll through them below and pick your favorite one.